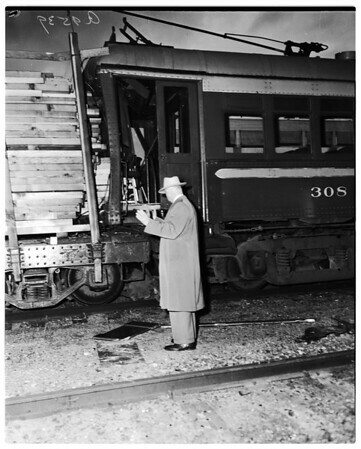 Conductor Hugh E. Wilson, head bandaged, most seriously hurt of five injured. (If third man shows near camera he is Billy Billings, a seaman, knee slightly injured. Other shsots at scene of wreck: Man in overcoat is P. A. Stephens, supervisor for Harbor Belt Line. Switch engine pulling lumber flats is a Harbor Belt Line engine".